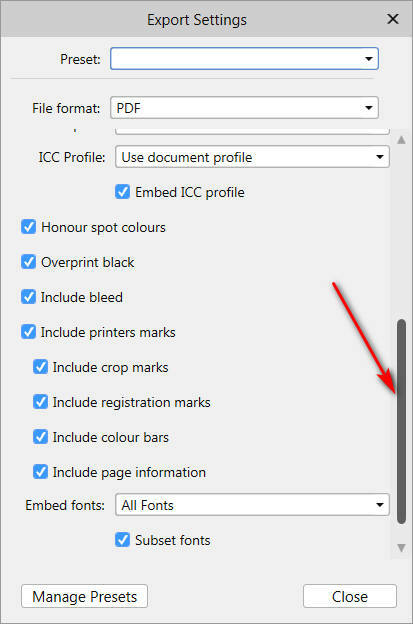 Can you provide a screenshot of what you see when you click on the More option after selecting PDF on the Export window. This might sound silly, but did you scroll down far enough to see all the options ? 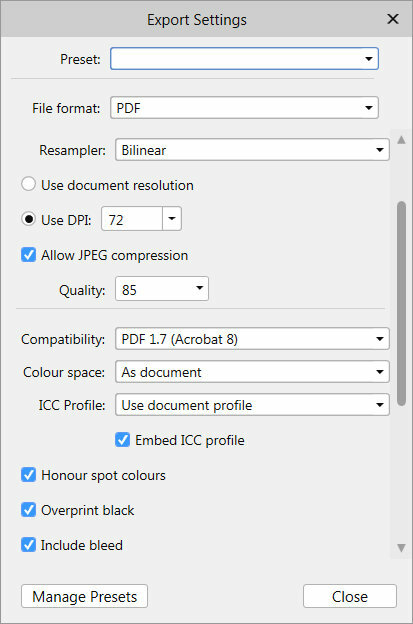 This is the "More" option in the PDF Export dialog box. Toltec for the win. Thank you so much for making me feel like the biggest dummy ever. When you suggested this, I was annoyed because SURELY I would have noticed a scroll bar. I have spent literally days on this and enlisted my husband and children to help me figure out where the dang crop mark option was. I have never felt so dumb in my whole life. Thank you for that, haha. Sorry to have stolen time out of both yours and Lee D's days. I've got a burning desire to take down this thread and destroy all evidence of my stupidity. But perhaps there's another weirdo out there who will appreciate not having to be called out on their own stupidity, haha. I am loving this app more and more every time I use it. Thanks Lee D and Toltec for your time. How do you think I knew what the problem might be ? Unlike Lee D, who is one of those clever, technical, software chappies and immediately thought of clever, technical, software issues, I am dumb enough to have done similar things myself.